Is your Samsung device acting up? It might be time to reset it. As you use your Samsung Galaxy smartphone, Note, or Tab, you may find your device having problems with apps crashing or freezing, making weird noises or making no noise at all, not syncing with other devices, or not receiving and/or making calls. In these cases, you can reset your device to factory specs by performing a factory data reset within the Settings screen. You may be in a more serious situation where your screen is blank, frozen, or won’t accept any of your finger (or S Pen) input. In that case, your only recourse is to perform a hard factory reset by using the device buttons to access the device’s firmware, which is the permanent software programmed into your device’s memory. A factory reset deletes all information and data on your device including all apps, settings, music, photos, and videos. These instructions for a factory data reset apply to all Samsung Galaxy Tab tablets, Galaxy S smartphones, and Galaxy Note phablets running Android 7.0 (Nougat) and 8.0 (Oreo). When you set up your device the first time, Android informed you it would back up your data to your Google account automatically. So, when you set up your device after the reset, you’ll be able to restore your apps and data. In the Settings screen, swipe up in the category list until you see Cloud and Accounts, if necessary. In the Cloud and Accounts screen, tap Backup and Restore. In the Google Account section, tap Back Up My Data. In the Back Up My Data screen, tap Off to turn backup on. Your device will then back up your data to Google automatically. In the Settings screen, tap Back Up and Reset. In the Backup and Restore section, tap Back Up My Data. Even if you back up your data, you need your Google email address and password at the ready because after you reset after the reset because your device will ask you to log into your Google account. What’s more, if you have a decryption key for your SD card, you ‘ll need to know that key, too, so you can access the files stored on that card. In the Settings screen, swipe up in the category list (if necessary) until you see General Management. In the General Management screen, tap Reset. In the Reset screen, tap Factory Data Reset. In the Factory Data Reset screen, tap Reset or Reset Device, depending on the device you have. After a minute or two, you’ll see the Android Recovery screen. Press the Volume Down button until the Wipe data/factory reset option is selected. In the warning screen, press the volume down button until the Yes option is highlighted. After a few seconds, the Android Recovery screen reappears with the Reboot System Now option selected. Press the Power button to reboot your system. In the Backup and Reset screen, tap Factory Data Reset. In the Factory Data Reset screen, tap Reset Device. After your device resets, you see the Welcome screen and you can set up your device. Instructions for the Galaxy S8, S8+, and Note 8 appear in the next section. Press the Power, Volume Up, and Home buttons at the same time. Note that you may see screens saying, “Installing update” and “No command”, but you don’t have to do anything in these screens except continue waiting for the Android Recovery screen to appear. In the Android Recovery screen, press the Volume Down button until the Wipe data/factory reset option is selected. After a few seconds, the Android Recovery screen reappears with the Reboot System Now option selected. Press the Power button to reboot your device. After your device resets, then after a few minutes you’ll see the Welcome screen and then you can set up your device. Press the Power, Volume Up, and Bixby buttons at the same time until you see the Samsung logo. Note that you may see subsequent messages saying, “Installing update” and “No command”, but you don’t have to do anything in these screens except continue waiting for the Android Recovery screen to appear. What Happens If I Can't Reset? 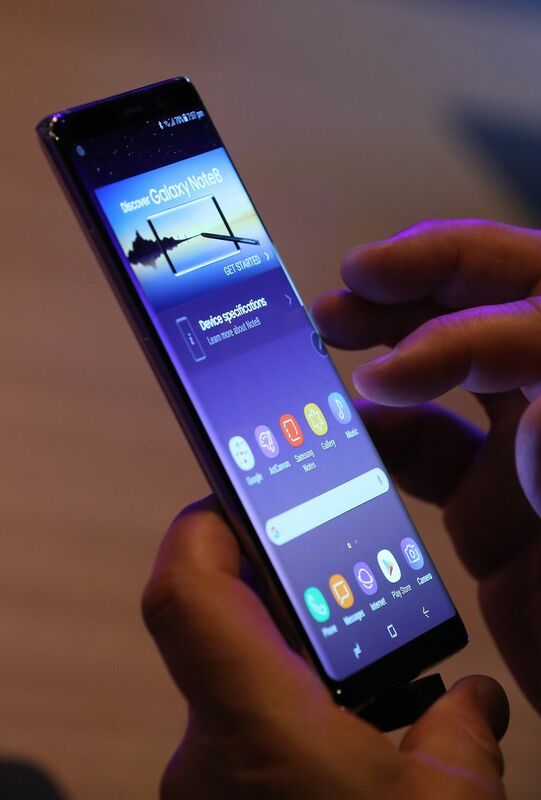 If your device won’t boot so you can set it up, then you need to contact Samsung either on its website for information and/or a live online chat, or by calling Samsung at 1-800-SAMSUNG (1-800-726-7864) from 8 a.m. to 12 a.m. Eastern time Monday through Friday or from 9 a.m. to 11 p.m. Eastern time on weekends. The Samsung support team may ask you for permission to access your device to test it and see if it needs to be mailed to them for repair.